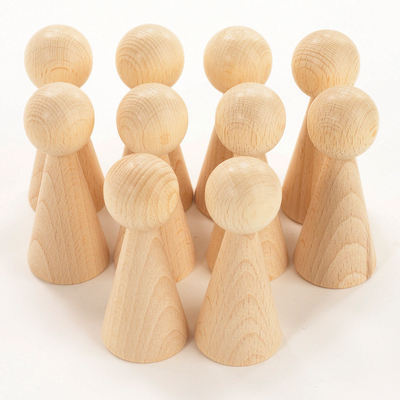 Our Wooden Conical Figures 100mm Pack 10 have been specifically developed for use during heuristic play. Crafted from durable wood, each conical is intended to encourage curiosity, creativity and discovery in young children with their open-ended nature. Allow children to play with each piece, stacking them or lining them up and allowing their imagination to run free and wild. Each piece can be quickly wiped clean and stored in the supplied carried bag for each transportation. Here at Gompels, we have a range of heuristic toys including our Wooden Spools and our Wooden Cubes.